ACOUSTIC EXPO 2014: Much more than just a singer/guitarist, Jon Gomm is passionate about the roots of the music that influences his songwriting. Here, he shows us the rhythmic links between Africa and the blues through a variety of shuffle grooves played, as ever, in Jon's percussive style. Jon then demonstrates how he might use such rhythms to develop an idea for a song. When trying this out, it is very important to nail the physical co-ordination of each pattern before progressing, because each stage is an extension of the previous. We're presenting Jon's percussive strikes on an extra stave underneath the usual notation and tab you'd find in our standard transcriptions. We've shown all the main hits here in this mini percussive tab guide. If you struggle with Jon's unconventional playing, why not experiment with some percussive strikes of your own that require less movement? Here, Jon demonstrates a blues shuffle rhythm in 12/8 time using percussion. In 12/8, count four main pulses in each bar of music (count '1 2 3 4') and then break that down into shorter rhythms (count '1 & a 2 & a 3 & a 4 & a'). 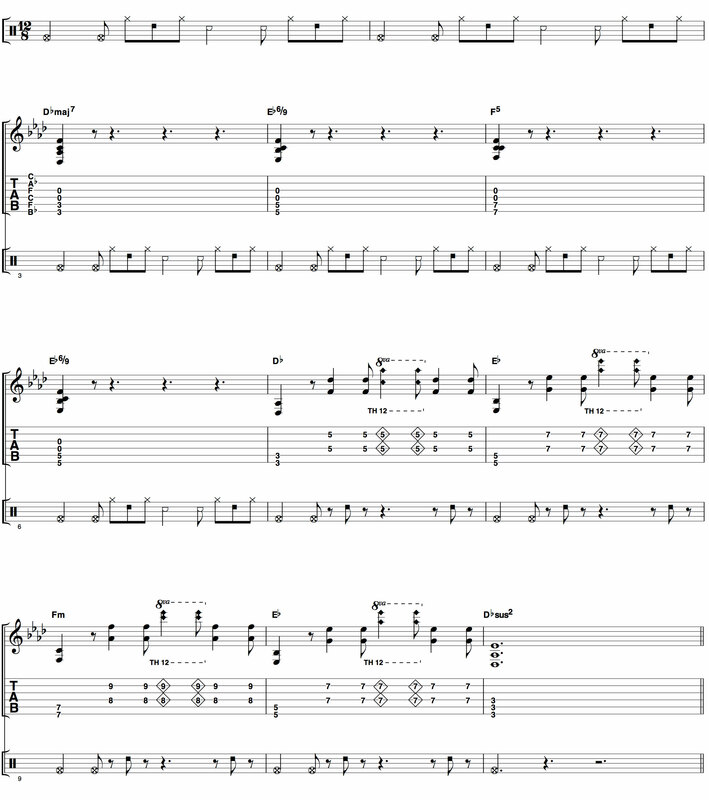 For a blues shuffle, emphasise the numbers and the 'a's, but ignore the '&'s. To apply a distinctly African flavour, Jon adds in percussive strikes on some of the '&'s using his pick hand thumb to slap the guitar's top. These extra strikes help communicate the link between sub-Saharan African rhythms and the basic shuffle groove that's so intrinsic to blues. This is essentially the same rhythm as the previous example except that Jon adds a speedy 16th-note variation. The unusual percussion technique and the speed of Jon's playing make this otherwise simple variation a bit of a challenge, so make sure to practise at a sensible tempo. If you've got to grips with the percussive pattern then try this, as Jon adds one chord per bar while maintaining the percussion. It's a step up, but without too much of a challenge. 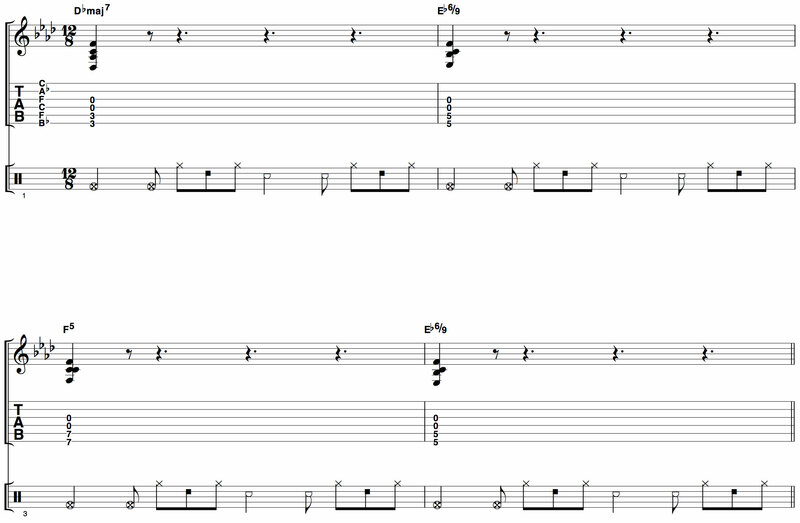 Simply fret the notes as shown in the tab, slap the strings as you play the first percussive strike in each bar, and let the strings ring out. Finally, here's the whole thing with each element introduced one at a time. Most of the hi-hat hits are replaced with hammered-on two-note chords, but as the sound is richer now, you shouldn't sense any gap. The diamond-shaped notes are tapped harmonics, where Jon strikes the strings over the 12th fret to generate a bell-like tone.